Sinful Colors' Boldacious display has been out at Walgreens for at least a month, but I'm still seeing it around and fairly full. It's an assortment of eye-catching brights and bold colors. 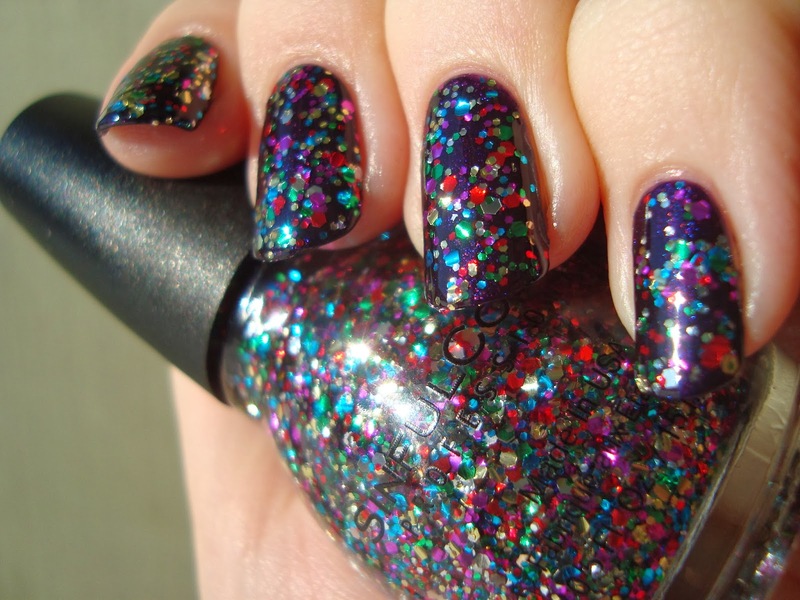 There's also a new polish in it, a glitter mix called Pride. Since most of the shades in this display are repromotes, my swatches are mostly reruns. Aside from the swatches in today's post, the display also includes Decadent, Citrine, and Feeling Great. Innocent, Feeling Great, Citrine, and Enchanted are core at Walgreens, Blue By You is core at Rite Aid, and the rest are returning LE's. Pride has a clear base with a mix of purple, red, green, blue, gold, and silver hexagonal glitter in two sizes. I hesitated to buy Pride at first, since I thought it might be a bit too "Boldacious" for me. It is pretty intense, but I like it more than I thought I would. The application wasn't too bad. I did have to dab to keep the glitter from huddling together. The base is thick, but not gloppy. 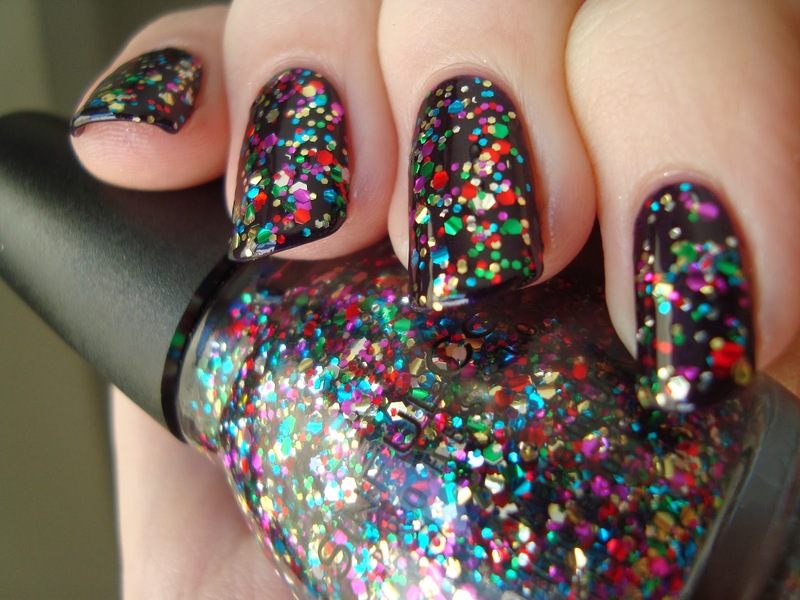 I can't see myself wearing it as a full mani, but it could be good for an accent nail. I might be reading too much into it, but the name seems to be a nod to gay pride. I'm more than cool with that, if it is. It would be perfect for parades and other events. Pull Over is a yellow cream. I found Pull Over at a Dollar Tree and snagged it because of my growing fascination with yellow polish. I hate yellow for pretty much everything else, but for some reason I'm finding myself drawn to bright yellow polishes. I don't understand that at all. I've had Pull Over since last fall, but I had to much new stuff to swatch at the time. I was happy to see it in this new display, since it's a great excuse to finally wear it. The color's great! It's somewhere between taxi cab and yellow mustard. I can't say if the formula will be the same in newer bottles, but mine is very thin and watery. This is four coats. My camera couldn't quite make up its mind about the color, since it's intense. It also changes a little with the light, since it's not the most opaque cream ever. It's just a little nudge closer to orange than a true yellow and exactly medium in brightness. It's such a perfect yellow that I can forgive its watery formula. Again, I'm not sure if newer bottles will have the same formula. ...and now the reruns. Click through for reviews and additional photos. Innocent is an acid green cream. Blue By You has a medium blue base with an intense aqua shimmer. Fig is a magenta shimmer. Georgio is a deep maroon cream. Enchanted is a dark blue-toned purple cream. Bottom line: This display has a lot of my past favorites! Pride takes a bit of dabbing, but would be great for Gay Pride events. Do you ever find yourself drawn to color family in polish that you don't like in anything else? I still don't get what it is with me and yellows! Darn! When I first saw this collection, I kept contemplating Pride and walked away from it. I hope it's still around. As always, I love your swatches! The pride glitter polish looks really great. I agree this may be a little over the top for a full mani but I think an accent nail with darker colour polish for the rest would look great and give it that pop of colour! I got pride to use as a coming out mani when I told everyone Im gay and i love it! it is the perfect polish for gay pride in my oppinion and i love that sc was the first to make something like this, being as theyre my favorite brand! It looks wonderful matte over black! That's perfect! Congrats on coming out! I hope everyone treats you with respect.